Hai to Gensou no Grimgar/Grimgar of Fantasy and Ash/Grimgar: Ashes and Illusions (will be referred to as Grimgar in this article) is a light novel adaptation anime that aired in the Winter 2016 season. As always I would like to put a small disclaimer here. These are all my opinions and views on Grimgar, I am in no way opposing any views anyone else may have about this series. With that out of the way, let’s begin. Grimgar is a very stereotypical isekai anime with 1 difference. As most isekai, it has a main cast that wake up in another world without their memories, in a fantasy world that works a lot like an rpg game, and they need to fight to survive. However the one major difference is that these characters are not overpowered as the MC usually is in isekais. In fact our main cast are the most underpowered and weak characters which provides a nice change of pace from regular isekai tropes as I am someone who enjoys isekai shows. This show gives me a lot of DanMachi (Is it wrong to try to pick up girls in a dungeon?) vibes and I actually loved that show. This show is quite like a good mix of DanMachi and the regular isekai. In general I am a fan of Light Novel adaptations as an avid lover of Sword Art Online, however I must admit that Manga adaptations are usually much better anime than Light Novel adaptations. The actual quality of the source material does not come into play here however its just a trend that it seems like its easier to make a good anime out of a manga than a light novel, understandably too. 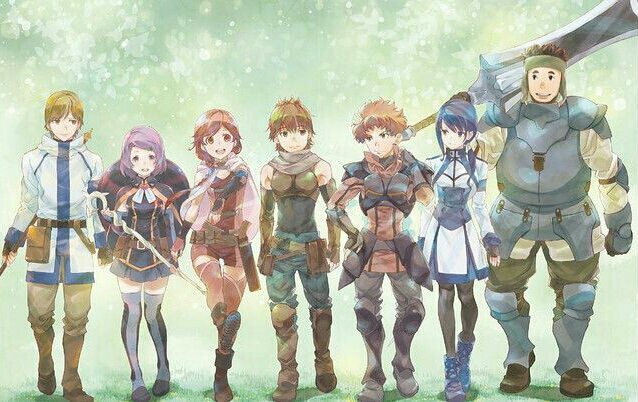 Grimgar is a rather complicated show, with a mix of emotions and lovable characters, with that sentence out of the way and the intro off of my chest, let’s begin. The story is probably the weakest point with the Grimgar anime. The story is very typical and does not strike me as anything different. I wasn’t very invested in the plot as there isn’t really one. The only plot is the main party struggling to survive and Haruhiko struggling with the relationships between the people in the party. Apart from that there isn’t really one large plot or arc for the show. There are small arcs but they don’t really contribute to a larger conflict which is one of the biggest issues I have with the show. I only wish for a larger villain, conflict or plot as that would’ve made the overall quality and enjoyment of this show much more than it currently is. Grimgar has an excellent animation style. Each frame looks like it’s hand drawn and coloured and is overall very aesthetically pleasing. Everything is perfect and I actually cannot find any issues or hitches with the art or animation. It has a different feel and is utterly beautifully unique within the industry. The action sequences in Grimgar are some of my favourites of all time. The dynamic animation and the choreography for the fight sequences are insanely awesome. The fight scenes and the animation/art is, on its own, makes Grimgar a worthy watch. Unfortunately the studio that did the art and animation for Grimgar as well as other incredibly animated shows such as Fate Stay Night Unlimited Blade Works, closed due to the director’s health, so we may never see this level or style of animation ever again. The sound for Grimgar can be summed up by a simple ‘meh’. It was so plain and usual that I can barely even recall the soundtrack minutes after watching it. The soundtrack during the fight scenes is good and helps with the tension but apart from that if you love the soundtrack for anime then Grimgar’s is nothing special. The only reason this gets a 5/10 from me is because of the OP for the anime which I actually really like (‘Knew Day’) and gives me a churning stomach whenever I hear it. The OP is one of my favourites of all time and suits the premise of the show extremely well. Characterization is where Grimgar truly shines, each important character shows growth throughout the series and we are able to clearly see that. The entirety of the main cast alongside the relationships they have with each other and others outside of their party is very well developed throughout the anime. Haruhiko, Ranta, Yume and Merry get by far the most development in the show and are my favourite characters. The only issue I have is that I would’ve like to see Shihoru, Moguzo and Manato get more development throughout the show aswell as some side characters like Renji’s party. However much I may have praised certain aspects of Grimgar throughout this article, the undeniable fact is that the quality of an anime does in fact end up coming down to how enjoyable it is to watch, and unfortunately, Grimgar did not give me that excitement that left me wanting more, until the last 3 episodes. Grimgar’s slow pacing was nice for world building but it weakened the potential of the show and made the first half of the show drag on quite a bit. When I come across a show that catches me, I am unable to stop watching it, but for Grimgar that didn’t happen like it did in anime like FMAB or Nanatsu No Taizai for instance. Grimgar left me feeling okay at the end of each episode and I just felt like I needed to watch the next one to get it over with, not so that I could see the characters again. This was until the last 3 episodes, which in fact did leave me excited to watch the rest, mostly because of the focus on Ranta, Haruhiko and Merry (still prefer Yume though) and Deathspots, that was an exciting arc. One of my favourite moments in the show would have had to be the awesome Haruhiko X Yume moment which gave both of them tremendous character development and hinted at a relationship that I had been hoping for since I started watching. Grimgar is a mildly enjoyable show to watch which I recommend watching purely for the excellently choreographed fight and action scenes. It is something you watch when you have nothing better to watch and is not worth pausing or dropping another series for. You may enjoy the anime, you may not, but it’s worth watching just for the hell of it, and the animation. is it if you like, but I don’t plan on continuing the series by reading the Light Novels and I honestly don’t recommend that you do either.